A recreational Irish dancer is one who takes dance for the love of it and may attend just a few or no competitions throughout the year. Simply because a dancer is recreational does not mean they are not permitted to compete. Recreational dancers may compete as much or as little as they choose. This is the perfect option for children who wish to be involved in different sports and activities and Irish Dance is one of them! Providing a positive learning environment where every dancer is reaching personal goals and growing as a person and as a dancer is our top priority – and non-competitive dancers are a huge part of our OGQ family. We as teachers expect non-competitive dancers to work hard and make progress every year but the focus is on progress rather than competition. There are many facets of Irish dance covered in our non-competitive program, including performance, traditional sets, ceili, and solo dancing. Choosing to be non-competitive does not mean you are choosing to dance with poor technique or you don’t need to practice because you aren’t focused on competition. At O’Grady Quinlan we expect all dancers to learn proper technique, through a combination of solo, performance, ceili and traditional set classes that help our students develop into well-rounded dancers. Dancers who have chosen the non-competitive path may change their mind at a later date to switch over to the competitive side of things. It’s your journey. Set your path to meet your needs and expectations. 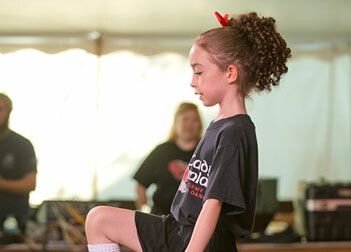 Do you have additional questions about recreational Irish Dance Classes? Please use our contact page to email us.